Seat Open racing for (stock seat) Original polster. Solo seat. Smooth surface compliant coating, pin-hole free. Basic and cheapest version is GFK fiberglass. Thanks to the precision of employees in handmade production and the emphasis on the quality of these products, they have perfect flexibility, durability and low weight. Composition - UV stable white gelcoat (not paint), fiberglass mat and fiberglass cloth impregnated with resin. In the stressed and susceptible places to break the parts are reinforced by Kevlar-Carbon layers as needed, or Coremat for the seats. Parts are flexible and have a smooth surface. Are made for painting. Why GFK- fiberglass? For example those who want to put fairings on for the circuit at low cost. Or inexpensively replace a precious piece (broken) original. Lightweight version GRP. This design was developed on testing and requirements of the elite teams in the prestigious race series. With these products, we focus on the lowest weight, while maintaining maximum flexibility. They are lighter than conventional GRP parts. In the stressed and susceptible places to break the parts are reinforced by Kevlar-Carbon or Coremat for the seats. The material used fiberglass, Kevlar-Carbon, white or transparent gel and resin. Why GFK - fiberglass Racing? - For anyone who wants to reduce the weight to the maximum. Weight comparable to carbon parts. 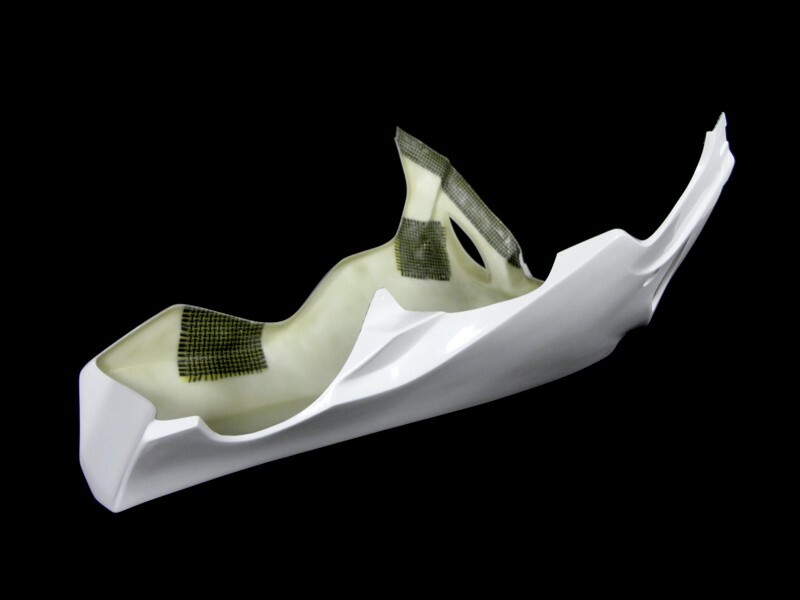 Suitable for racing teams or individuals, which paint their racing fairings. With these products, we focus on the lowest weight, while maintaining maximum flexibility and abrasion resistance. 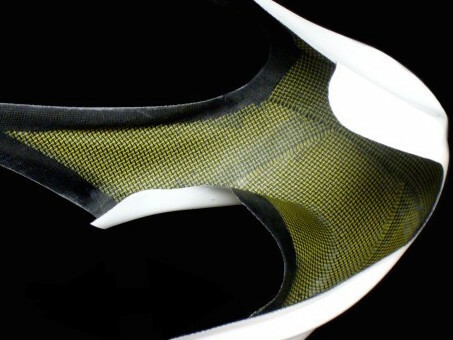 Composition - Carbon-Kevlar fabric into the white gelcoat. This design was developed based on testing and requirements of the elite teams in the prestigious series of races. In terms of prices of comparable economical alternative to carbon parts. They are lighter than GRP parts. Parts are not polished, so that it easily painted. The material used Kevlar-Carbon, Carbon, white gelcoat and resin. Coremat for the seats. Why choose Performance? - As the name, parts for high performance best ratio quality, price, low weight. 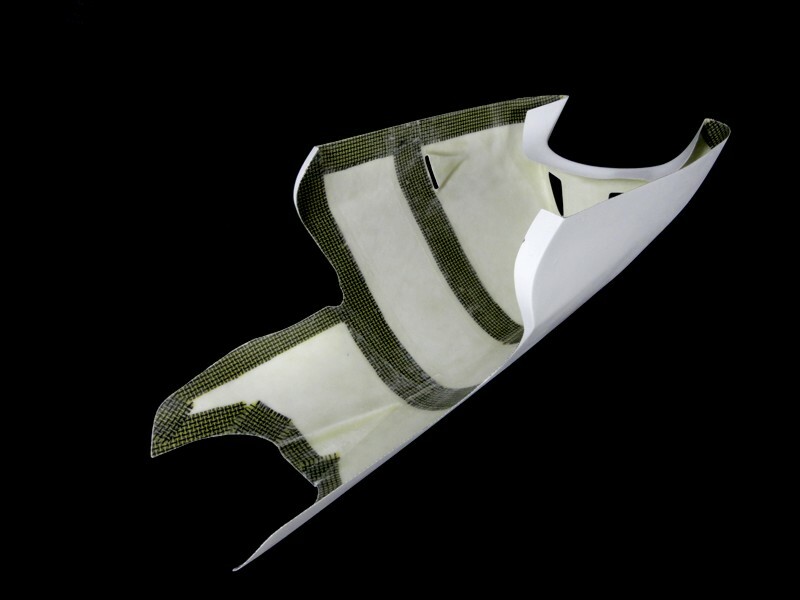 More flexible, more resilient for longer life than GRP parts, cheaper than the market more expensive Carbon parts. Weight and functionality comparable to carbon parts..
Low weight, flexibility, durability, thanks to the joining of composite materials and precise manual production. Several layers of Kevlar-Carbon reinforcements for extra durability. To mount the seat undertray to seat racing can use the quick-screws or classic bolts.